60 Minutes' newsman Morley Safer isn't having any of this Internet B.S. I don't believe there's a link to the article online, but in today's Globe & Mail, Safer comes off as a grumpy ol' man pontificating about something that he himself seems to know little about: the Internet. In the article, he repeats his famous line that he would no more trust a citizen journalist than he would a citizen surgeon. Pithy, yes, but I don't think his comparison holds up under scrutiny: some of the best journalists in the world didn't take a single day of classes, which isn't true of surgeons. I hope. I've always liked Safer in a grandpaesque kinda way, and I usually show one or two of his 60 Minutes corporate-culture pieces in PR class when we look at Employee Communications. When you watch Safer's reports, especially in a roomful of young students, one thing becomes painfully clear: Safer is the king of the puff piece, and has never met a cliche he doesn't like. Here, he profiles SAS and its founder, Ron Goodnight. Groan of the year award goes to Safer's line, "Ron Goodnight said...good night!" Ta-dah! Nope, the Internet could never achieve so high a level of journalism! And without a voiceover no less? Sacrilege! It's sad that Safer is knocking a new medium, when he himself was a pioneer in TV journalism - a form that was mocked by print journalists at the time and, until 60 Minutes, considered to be beneath a "real" investigative reporter. 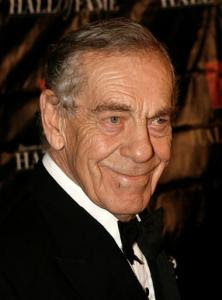 Any good reporter should have a driving curiosity about the world, even Morley Safer. So while he may not think that there's anything good online, he probably should check it out for himself. Or don't TV reporters do that anymore? Every year, a student will inevitably say to me, "I'm only doing well in my Journalism class, because that's the only field I'm interested in." My reply: "Oh, so when you graduate, you're only going to be writing articles about journalism?" Good luck with that! Those who succeed in the communications business - journalism, advertising, PR, etc. - are those who anticipate and embrace change. As Billy Bragg once sang, "You can be active with the activists or sleeping with the sleepers - while you're waiting for the great leap forward."